Thyroid nodules are nodules (raised areas of tissue or fluid) which commonly arise within an otherwise normal thyroid gland. They may be hyperplasia or a thyroid neoplasm, but only a small percentage of the latter are thyroid cancers. Small, asymptomatic nodules are common, and many people who have them are unaware of them. But nodules that grow larger or produce symptoms may eventually need medical care. Goitres may have one nodule – uninodular, multiple nodules – multinodular, or be diffuse. Often these abnormal growths of thyroid tissue are located at the edge of the thyroid gland and can be felt as a lump in the throat. When they are large, they can sometimes be seen as a lump in the front of the neck. Sometimes a thyroid nodule presents as a fluid-filled cavity called a thyroid cyst. Often, solid components are mixed with the fluid. Thyroid cysts most commonly result from degenerating thyroid adenomas, which are benign, but they occasionally contain malignant solid components. After a nodule is found during a physical examination, a referral to an endocrinologist, a thyroidologist or otolaryngologist may occur. Most commonly an ultrasound is performed to confirm the presence of a nodule, and assess the status of the whole gland. Measurement of thyroid stimulating hormone and anti-thyroid antibodies will help decide if there is a functional thyroid disease such as Hashimoto's thyroiditis present, a known cause of a benign nodular goitre. Fine needle biopsy for histopathology is also used. Thyroid nodules are extremely common in young adults and children. Almost 50% of people have had one, but they are usually only detected by a physician during the course of a health examination or fortuitously discovered during the investigation of an unrelated condition. Likely ultrasonography if at least 1 cm large in adults, or for any size in children. Comet tail artifacts from a colloid nodule is highly suggestive of a benign nodule. Ultrasound imaging is useful as the first-line, non-invasive investigation in determining the size, texture, position, and vascularity of a nodule, accessing lymph nodes metastasis in the neck, and for guiding fine needle aspiration cytology (FNAC) or biopsy. Ultrasonographic findings will also guide the indication to biopsy and the long term follow-up. High frequency transducer (7–12 MHz) is used to scan the thyroid nodule, while taking cross-sectional and longitudinal sections during scan. Suspicious findings in a nodule are hypoechoic, ill-defined margins, absence of peripheral halo or irregular margin, fine, punctate microcalcifications, presence of solid nodule, high levels of irregular blood flow within the nodule or "taller-than-wide sign" (anterior-posterior diameter is greater than transverse diameter of a nodule). Features of benign lesion are: hyperechoic, having coarse, dysmorphic or curvilinear calcifications, comet tail artifact (reflection of a highly calcified object), absence of blood flow in the nodule, and presence of cystic (fluid-filled) nodule. However, the presence of solitary or multiple nodules is not a good predictor of malignancy. Malignancy is only diagnosed when ultrasound findings and FNAC report are suggestive of malignancy. Another imaging modality, which is ultrasound elastography, is also useful in diagnosing thyroid malignancy especially for follicular thyroid cancer. However, it is limited by the presence of adequate amount of normal tissue around the lesion, calcified shell around a nodule, cystic nodules, coalescent nodules. Blood tests may be done prior to or in lieu of a biopsy. The possibility of a nodule which secretes thyroid hormone (which is less likely to be cancer) or hypothyroidism is investigated by measuring thyroid stimulating hormone (TSH), and the thyroid hormones thyroxine (T4) and triiodothyronine (T3). Tests for serum thyroid autoantibodies are sometimes done as these may indicate autoimmune thyroid disease (which can mimic nodular disease). 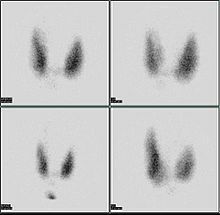 A thyroid scan using a radioactive iodine uptake test can be used in viewing the thyroid. A scan using iodine-123 showing a hot nodule, accompanied by a lower than normal TSH, is strong evidence that the nodule is not cancerous, as most hot nodules are benign. Only a small percentage of lumps in the neck are malignant (around 4 – 6.5%), and most thyroid nodules are benign colloid nodules. There are many factors to consider when diagnosing a malignant lump. Trouble swallowing or speaking, swollen cervical lymph nodes or a firm, immobile nodule are more indicative of malignancy, whereas a family history of autoimmune disease or goiter, thyroid hormonal dysfunction or a soft, painful nodule are more indicative of benignancy. The prevalence of cancer is higher in males, patients under 20 years old or over 70 years old, and patients with a history of head and neck irradiation or a family history of thyroid cancer. Solitary thyroid nodules are more common in females yet more worrisome in males. Other associations with neoplastic nodules are family history of thyroid cancer and prior radiation to the head and neck. Most common cause of solitary thyroid nodule is benign colloid nodules and second most common cause is follicular adenoma. Radiation exposure to the head and neck may be for historic indications such as tonsillar and adenoid hypertrophy, "enlarged thymus", acne vulgaris, or current indications such as Hodgkin's lymphoma. Children living near the Chernobyl nuclear power plant during the catastrophe of 1986 have experienced a 60-fold increase in the incidence of thyroid cancer. Thyroid cancer arising in the background of radiation is often multifocal with a high incidence of lymph node metastasis and has a poor prognosis. Worrisome sign and symptoms include voice hoarseness, rapid increase in size, compressive symptoms (such as dyspnoea or dysphagia) and appearance of lymphadenopathy. TSH – A thyroid-stimulating hormone level should be obtained first. If it is suppressed, then the nodule is likely a hyperfunctioning (or "hot") nodule. These are rarely malignant. FNAC – fine needle aspiration cytology is the investigation of choice given a non-suppressed TSH. Imaging – Ultrasound and radioiodine scanning. 85% of nodules are cold nodules, and 5–8% of cold and warm nodules are malignant. 5% of nodules are hot. Malignancy is virtually non-existent in hot nodules. An alternative using high intensity focused ultrasound or HIFU has recently proved its effectiveness in treating benign thyroid nodules. This method is noninvasive, without general anesthesia and is performed in an ambulatory setting. Ultrasound waves are focused and produce heat enabling to destroy thyroid nodules. Focused ultrasounds have been used to treat other benign tumors, such as breast fibroadenomas and fibroid disease in the uterus. Levothyroxine (T4) is a prohormone that peripheral tissues convert to the primary active thyroid hormone, triiodothyronine (T3). Hypothyroid patients normally take it once per day. An autonomous thyroid nodule or "hot nodule" is one that has thyroid function independent of the homeostatic control of the HPT axis (hypothalamic–pituitary–thyroid axis). According to a 1993 article, such nodules need to be treated only if they become toxic; surgical excision (thyroidectomy), radioiodine therapy, or both may be used. Wikimedia Commons has media related to Thyroid nodules. ^ "New York Thyroid Center: Thyroid Nodules". ^ Vanderpump, MP (2011), "The epidemiology of thyroid disease", Br Med Bull, 99 (1): 39–51, doi:10.1093/bmb/ldr030, PMID 21893493. ^ "Symptoms and causes - Mayo Clinic". Mayo Clinic. ^ Bennedbaek FN, Perrild H, Hegedüs L (1999). "Diagnosis and treatment of the solitary thyroid nodule. Results of a European survey". Clin. Endocrinol. 50 (3): 357–63. doi:10.1046/j.1365-2265.1999.00663.x. PMID 10435062. Archived from the original on 2013-01-18. ^ Ravetto C, Colombo L, Dottorini ME (2000). "Usefulness of fine-needle aspiration in the diagnosis of thyroid carcinoma: a retrospective study in 37,895 patients". Cancer. 90 (6): 357–63. doi:10.1002/1097-0142(20001225)90:6<357::AID-CNCR6>3.0.CO;2-4. PMID 11156519. ^ Russ G (Sep 2014). "Thyroid incidentalomas: epidemiology, risk stratification with ultrasound and workup". European Thyroid Journal. 3 (3): 154–63. doi:10.1159/000365289. PMC 4224250. PMID 25538897. Hoang, Jenny K.; Langer, Jill E.; Middleton, William D.; Wu, Carol C.; Hammers, Lynwood W.; Cronan, John J.; Tessler, Franklin N.; Grant, Edward G.; Berland, Lincoln L. (2015). "Managing Incidental Thyroid Nodules Detected on Imaging: White Paper of the ACR Incidental Thyroid Findings Committee". Journal of the American College of Radiology. 12 (2): 143–150. doi:10.1016/j.jacr.2014.09.038. ISSN 1546-1440. PMID 25456025. ^ Durante, Cosimo; Grani, Giorgio; Lamartina, Livia; Filetti, Sebastiano; Mandel, Susan J.; Cooper, David S. (2018-03-06). "The Diagnosis and Management of Thyroid Nodules: A Review". JAMA. 319 (9): 914–924. doi:10.1001/jama.2018.0898. ISSN 0098-7484. PMID 29509871. ^ a b Wong KT, Ahuja AT (2005). "Ultrasound of thyroid cancer". Cancer Imaging. 5: 157–66. doi:10.1102/1470-7330.2005.0110. PMC 1665239. PMID 16361145. ^ Diaz Soto, Gonzalo; Halperin, Irene; Squarcia, Mattia; Lomena, Francisco; Puig Domingo, Manuel (10 September 2010). "Update in thyroid imaging. The expanding world of thyroid imaging and its translation to clinical practice". Hormones. 9 (4): 287–298. doi:10.14310/horm.2002.1279. PMID 21112859. ^ Diana, S Dean; Hossein, Gharib. "Fine-Needle Aspiration Biopsy of the Thyroid Gland". Thyroid Disease Manager. Archived from the original on 12 July 2017. Retrieved 16 October 2017. ^ a b Renuka, I. V.; Saila Bala, G.; Aparna, C.; Kumari, Ramana; Sumalatha, K. (December 2012). "The Bethesda System for Reporting Thyroid Cytopathology: Interpretation and Guidelines in Surgical Treatment". Indian Journal of Otolaryngology and Head & Neck Surgery. 64 (4): 305–311. doi:10.1007/s12070-011-0289-4. PMC 3477437. PMID 24294568. ^ Ali, SZ; Cibas, ES (2016). "The Bethesda System for Reporting Thyroid Cytopathology II". Acta Cytologica. 60 (5): 397–398. doi:10.1159/000451071. PMID 27788511. ^ Grani, G; Calvanese, A; Carbotta, G; D'Alessandri, M; Nesca, A; Bianchini, M; Del Sordo, M; Fumarola, A (January 2013). "Intrinsic factors affecting adequacy of thyroid nodule fine-needle aspiration cytology". Clinical Endocrinology. 78 (1): 141–4. doi:10.1111/j.1365-2265.2012.04507.x. PMID 22812685. ^ Gates, Jeremy D.; Benavides, Linda C.; Shriver, Craig D.; Peoples, George E.; Stojadinovic, Alexander (2009). "Preoperative Thyroid Ultrasound In All Patients Undergoing Parathyroidectomy?". Journal of Surgical Research. 155 (2): 254–60. doi:10.1016/j.jss.2008.09.012. PMID 19482296. ^ Vigneri, R; et al. (1993), "[Physiopathology of the autonomous thyroid nodule]", Minerva Endocrinol, 18 (4): 143–145, PMID 8190053.